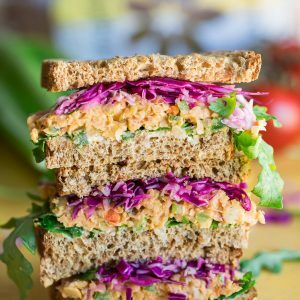 This tasty vegan Buffalo Chickpea Sandwich is ready to step up your sandwich game! This plant-based powerhouse features a zesty mashed chickpea salad and enough veggies to make your mama happy. Morning folks! Today I’m teaming up with Angelic Bakehouse to share a tasty sponsored recipe using their Sprouted 7-Grain Bread. Their “Sproutstanding” whole grain bread makes the perfect canvas for a whole lot of veggie lovin’! New to sprouted grains? Let’s chat! Using whole grains in bread baking is a great way to pack in extra fiber and nutrients. When these whole grains are sprouted first, it results in yet another boost of vitamins! Vitamin C, B vitamins, folate, fiber, and amino acids are all amped up and ready to rock your bread. Sprouting also reduces the glycemic index of carbs and makes the grains easier to digest. 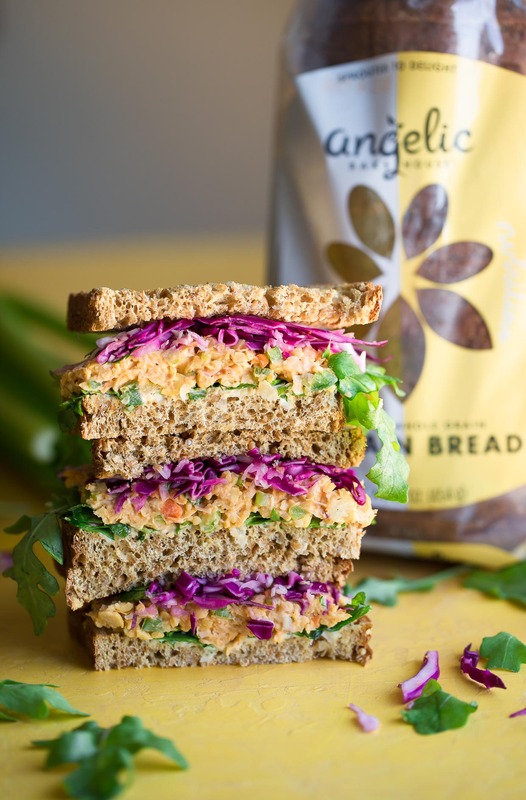 Angelic Bakehouse uses medley of sprouted red wheat berries, quinoa, millet, oat groats, barley, rye berries, and amaranth to create their wholesome sliced bread. It’s nutrition stats make my inner health nut happy while the taste and texture keep me coming back for more. They’re available at Costco stores nationwide and have a handy dandy store locator too. For breakfast I’ve been enjoying it spread with peanut butter and topped with fresh fruit, a drizzle of honey, and a sprinkling of chia seeds. Helloooo delicious! Naturally I had to let my sandwich in on the fun…. This buffalo chickpea sandwich rocks my world! Traditional buffalo sauce is made with a “red hot” style vinegar-based cayenne pepper hot sauce mixed with melted butter. By subbing hummus for the butter we’re able to achieve the same creaminess and also nix the need for mayo! 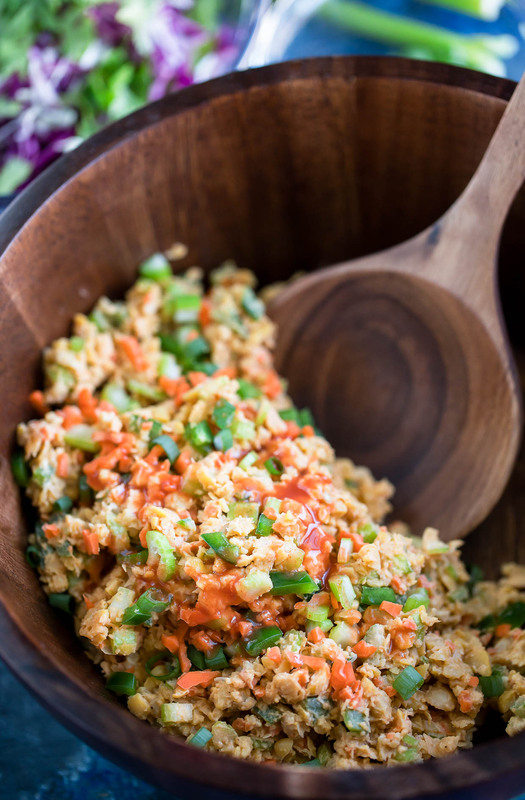 The hot sauce spiked hummus keeps the shredded chickpeas and veggies together (almost like a chicken or tuna salad) and delivers a nice kick as well. We served ours up alongside some celery sticks with ranch for dipping and mini pretzels. You could also pair this sassy sandwich with a cup of soup, chips, fresh fruit, or a side salad. Prepping make-ahead lunches for the week? The chickpea salad itself can be kept in an air-tight container for several days in the fridge, perfect for scooping onto sandwiches all week long! This tasty vegan Buffalo Chickpea Sandwich is ready to step up your sandwich game! This plant-based powerhouse features a zesty mashed chickpea salad and enough veggies to make your mama happy! Drain and rinse your chickpeas and add them to a large bowl. Mash with a potato masher and/or fork until texture appears flaked, almost like tuna salad. To make things even easier, break out the food processor and pulse a few times to coarsely mince chickpeas. Remove the stem of the jalapeños and cut in half. Scrape out the seeded center of each half. Feel free to add some of the seeds back in for a spicier sandwich. Add to the bowl with your chickpeas and veggies, then season with red hot sauce, salt, and pepper. Add hummus (plus any extra to taste) and stir well to coat. Lightly toast your Angelic Bakehouse Sprouted 7-Grain Bread or simply leave fluffy if preferred. Add sandwich spread of choice and top with buffalo chickpea salad. If topping your sandwich with red onion, just slice it super thin and pile it on. If using red cabbage or slaw mix, your can lightly dress it with a little oil and vinegar and season to taste. Add leafy greens, cabbage or red onion, and any extra veggies your heart desires. Enjoy! Nutrition Facts below are estimated using an online recipe nutrition calculator and will vary based on any extras/toppings added. Adjust as needed and enjoy! 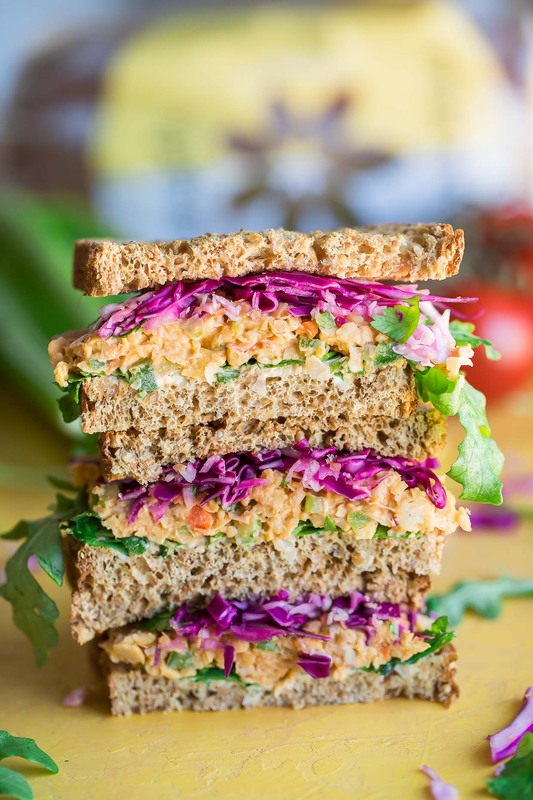 If you get a chance to try this vibrant vegan buffalo chickpea sandwich recipe, let me know! Leave some love in the comment form below or tag your photos with @peasandcrayons and #AngelicBakehouse on Instagram so I can happy dance over your creation! I can’t wait to see what you whip up! Oh wow, looks fabulous and yummy! I’ll have to try this, definitely everyone will love this! Thanks Melanie! We’re so in love with it! Such a good sub for meat! Looks so flavorful and delicious! This is what I want for lunch today!! I’d even have one for breakfast! This looks so heavenly and full of flavor!!! Totally saving this for lunch ideas at work! I’m not vegan, but I’m really trying to eat less processed meats. I dont even like chick peas, but this was amazing! I know have a great new lunch to bring to work. Thanks so much! 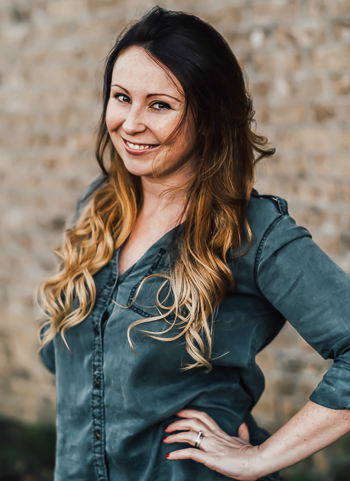 So super glad you enjoyed it Chrissie, thanks! You are a sandwich genius. This is a great way to jazz up lunch! Thanks for sharing this recipe! So glad you’re loving it Jamie – thanks!